Anyone visiting Pakistan would be amazed to find a very rare and indigenous art on the roads of the country wherever one happens to be visiting. The art, known as the truck art, is very common and decades old to decorate vividly the body, exterior and even the exterior of trucks and buses. So popular is the art, that now even rickshaws and tractor trollies are also being painted with exotic colours and designs to join the family of the truck art. When the mechanized transport had not come this part of the world, the horse drawn carriages of princes were painted with flowers and other designs to differentiate between the carriages of the ordinary people and the princely ones. As for the truck art, some believe it to have happened as early as 1920, when the famous Kohistan bus service had its buses decorated. The pioneer of this art is one Ustad Elahi Bukhsh, who decorated the buses that attracted passengers to those exotic and vividly coloured buses. Later the art travelled to other areas and has since become one of the most popular artwork that make these trucks and buses as something unique for tourists, visitors and even the passengers. Since the entire artwork is done by hand by seasoned and expert artists and decorators, each truck costs around $3,000-5000 to transform a plain truck or bus into a fairy tale. The themes of work may vary, mostly dependent on the mood of the artist and the area where the work is being done. The designs may include depiction of folk tales, natural scenes on all three sides of the truck body. The rear end is most eye catching as it is generally painted with photos of actresses, national heroes and natural scenes. For very long (something that still continues, though now declining and being replaced with more “pragmatic” photos) the paintings of former president of Pakistan, Muhammad Ayub Khan was the hot favourite. Since the former president belonged to the Khyber Pakhtunkhwa province of Pakistan and mostly the transporters are from the same area, their love for a president from their area made them portray their inner respect for him in the form of his paintings on their trucks. The painting was usually accompanied by a part of the verse from a song that read,”Teray janay kay baad, teri yaad aayee (We now realise your worth after you are gone now).” And no doubt, he was man and president to be remembered as during his times that Pakistan rose to be progressive and thriving economy that many envied in the South Asian region. Now pictures of Saima, a leading actress of Punjabi films, and Benzair Bhutto have also started to appear on the back of the trucks. But no other political personality has yet appeared to replace Ayub Khan. 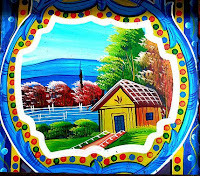 While in Pakistan, the truck art is mostly done by mostly using ordinary and cheap colours and add-on objects, it may have some similarity with the Dekotora artwork of Japan. 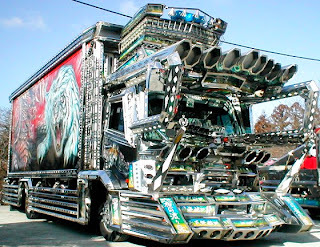 Dekotora, abbreviation of decoration truck, involves neon or ultraviolet lights,extravagant paints, and shiny stainless or golden exterior parts, such decorations can be found on both on the exterior and the interior. 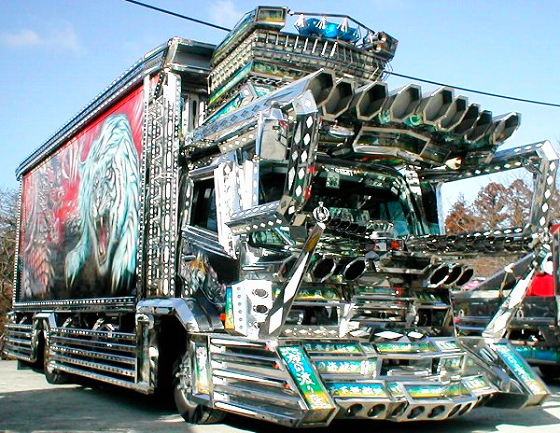 Dekotora may be created by workers out of their work trucks for fun, or they may be designed by hobbyists for special events. 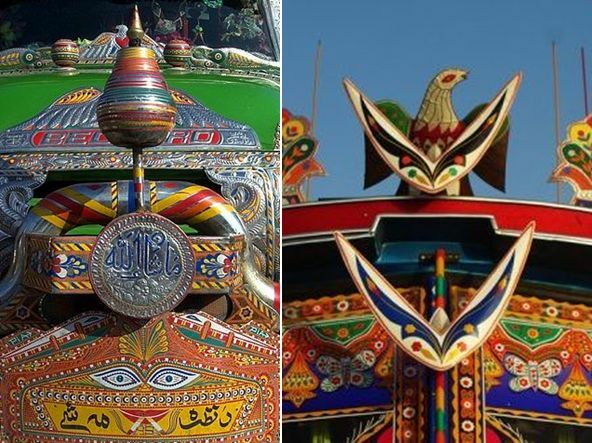 Although, the “technology” used in the truck art in Pakistan doesn't involve such expensive items as used in Dekotora, the artists using cheap paints and add-ons still come up with some of the most eye catching designs that makes an onlooker wonder about the amazing heights of their aesthetics and craftsmanship. 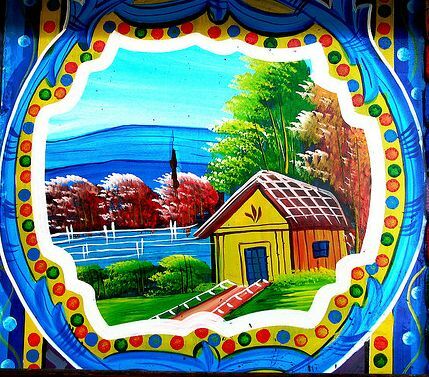 Eye popping paintings depicting natural landscapes, lights, and wood work, specially to decorate the doors of the cabins or even the inside of the cabin interior besides indigenous poetry verses are often preferred by the truck drivers. 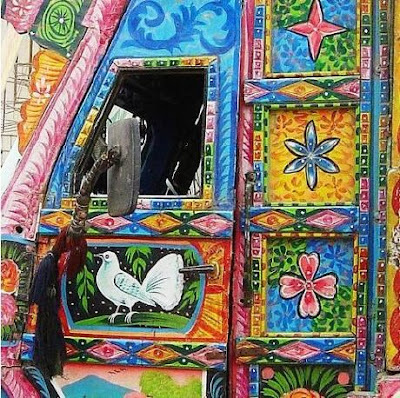 Karachi, being the hub of all imports and exports, draw maximum transport to it and thus has been transformed into a haven for truck art artists. Rawalpindi, Peshawar and Quetta follow suit and add to the truck art industry. 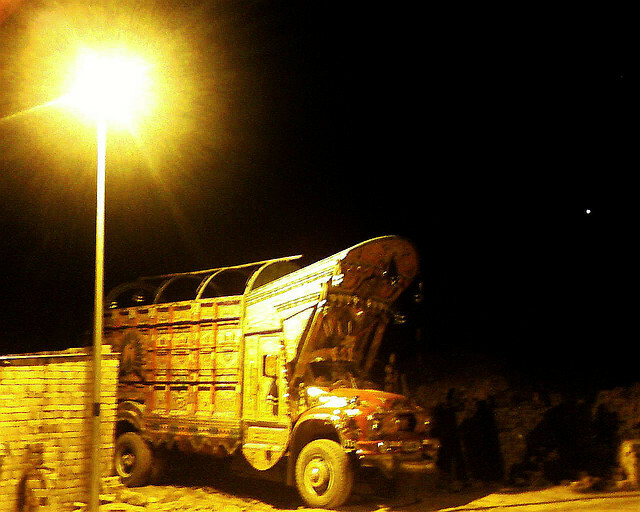 As per a survey, trucks decorated in Karachi and surrounding areas also use camel bone, while plastic items are added by artists in Rawalpindi. Peshawar, Quetta and Swat artists prefer more woodwork in their decorations. Thus one can make out the place of origin of the truck art by closely watching the type of decorations on a particular truck. While the truck art thrives on the roads of Pakistan, the art is also liked and displayed internationally as well. In 2002, the Smithsonian Folk Festival had a truck brought from Karachi to Washington and got it decorated right there on the National Mall. As a talent scout for the festival’s Silk Road theme, truck aficionado Jonathan Mark Kenoyer, an anthropology professor at the University of Michigan and a top us scholar of Pakistani culture, chose the pair for their versatility in incorporating the country’s disparate styles of truck art. Their finished masterpiece, a 1976 Bedford, is now part of the Smithsonian’s permanent collection. And those who were there in the Melbourne Commonwealth Games in 2006, would have definitely seen the Karachi to Melbourne Tram – a W-11 (pictured above) mini bus that one sees on the roads of Karachi, heavily decorated using bright and eye-catching colours. As a showcase of Pakistani culture, the tram was commissioned for the Commonwealth Games, and a team of W-11 decorators were invited to decorate the tram, which toured around the city for the duration of the games, playing Bhangra and Pakistani music. Recently, the Pakistani and German travelling/tour operating companies have joined hands to promote Pakistani truck art in Germany through painting it on a truck, which would tour various cities in both the countries. A simple but impressive ceremony was organized by Omar Travels recently where a truck of Prestroika Tours, Germany, especially painted in the traditional Pakistani design by Pakistani artists was unveiled for public exhibition, reports the Business Recorder.